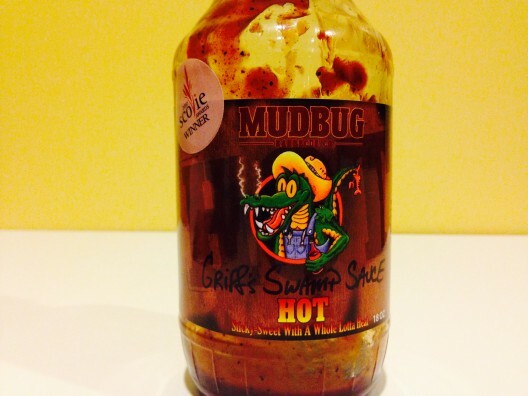 I just finished my review of Ohio-based BBQ Company Mudbug’s award winning sauce (2010 Scovie) and I just have to say that sometimes the simple things are truly best in life. You know I am one to appreciate something different: a little nutmeg here, some garlic/jalapeno there, a touch of apricot, or even putting as much bacon as you can possibly stuff into the bottle per FDA regulations is always welcome onto my tasting plate. 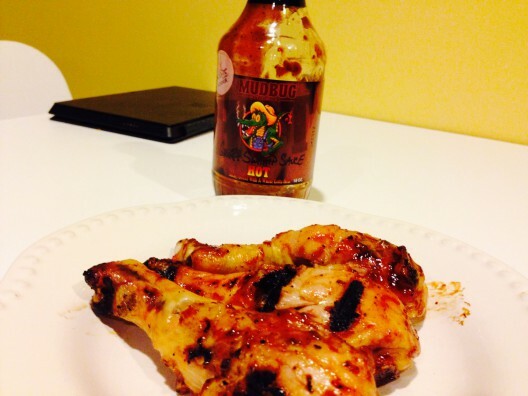 This sauce is simple, but executed perfectly. The label tells you it’s spicy and the cartoon alligator tells you … well, nothing but it’s professionally designed, fun-looking, and clean. The balance of tomato and brown sugar combine for a dark mahogany like color and its thicker than your average variety to create the perfect sauce wrap for your meat of choice. It’s equally good uncooked as a dipping sauce as it is straight off the grill. These drumsticks were amazing. Ingredients include high fructose corn syrup, but we’ll overlook this minor flaw to taste the smoky, oniony, garlic flavors embedded the caramelized brown sugar ooze. Highly recommended stuff. Sounds like a really great sauce! Definitely going to have to try this one! Thanks Jay, Yeah this was very tasty stuff! I LOVE the name! MUDBUG!